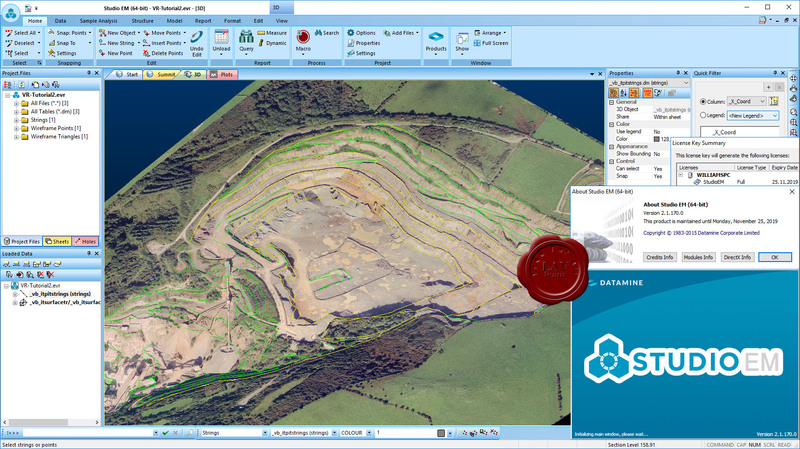 Datamine Studio EM is tailor made to meet the needs of exploration geologists. Leveraging the base technology of Datamine’s hugely successful Studio software series, Studio EM includes point and string editing, wireframing, basic block modelling and estimation functionality as well as the ability to dynamically link to an existing drillhole database. Studio EM also has a full set of plotting functionality for producing section plots, plan plots, strip logs and reports as well as comprehensive 3D viewing and the option to publish 3D pdf files. Integration - Studio EM can integrate with a host of existing data formats including the ability to dynamically link to a drillhole database for real time updates. Image support - easily import and view georeferenced images from a host of formats to drape as flat images or fit to existing topography data. Solids modelling - flexible tools to allow for either manual or automated creation of wireframe solids or surfaces to represent geological features. Block Modelling - harness the power of Datamine’s renowned block modelling tools to quickly create accurate volumetric models and carry out basic grade estimation. Communication - Save 3D data in the form of 3D pdf files that can be viewed on any device with a pdf viewer.